New Zealand has long been considered the cradle of penguin evolution. But two new fossil discoveries, affectionately known as Bice’s, (pronounced Bee-chee’s), and Rosie’s Penguins, are rewriting early penguin evolution and have taken the world by storm. Move aside Penguins of Madagascar; there are some new and cool kids on the block! But how did we get to this point and what is Bice’s and Rosie’s tale? It was a typical, sunny day north of Dunedin, wildlife capital of New Zealand; a good day for combing the beach looking for the ghosts of biodiversity past. 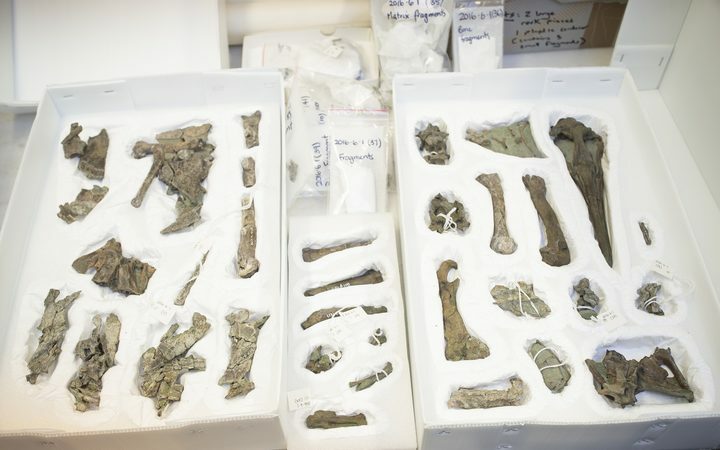 Te Papa’s Alan Tennyson and Canterbury Museum’s Paul Scofield were on the hunt for fossils from a lost world; a time shortly after the extinction of the non-avian dinosaurs (i.e. not birds, otherwise known as avian-dinosaurs) and large predatory marine reptiles, some 65 million years ago; an era called the Paleocene. The Paleocene was a time when many sea birds first evolved, and while there have been some fossil penguins from this time found in other areas of New Zealand, very little is known about penguin evolution during this early heyday. 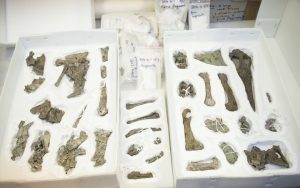 Like a growing number of new fossil discoveries, specimens that have been in museum collections for years, decades even, are throwing up new surprises. Alan’s round boulder was like that. Years after its discovery, he handed the boulder containing the “turtle” from Otago to Al Mannering, a renowned fossil preparation expert, as a bit of a diversion from working on more serious finds. But not all was as it seemed. In a case of mistaken identity worthy of Shakespeare, Alan’s turtle rock turned out to contain the partial skeleton of a large penguin; in fact, not just large, but a true giant (defined as greatly exceeding the size of the Emperor Penguin, which can grow up to 1.3 metres in height). Are you looking at me? Bice’s Penguin towered over today’s Emeror Penguin, weighing in at 101 kg and some 1.77 metres tall. Image courtesy of Te Papa. Artwork by Tess Cole. The penguin has been named Bice’s Penguin, (Kumimanu biceae), after Alan’s mum who fostered his love of natural history. This Otago giant dates back to 55-60 million years ago, during the early Paleocene. That’s only 5-10 million years after the extinction of most of the dinosaurs and marine reptiles at the end of the Cretaceous period, and some 20 plus million years before the Eocene and Oligocene eras. That is important because the true giants in penguindom were believed to have evolved during the Eocene and early Oligocene, (approximately 30-40 million years ago), millions of years after the Paleocene era. In terms of storytelling, that is like knowing that giants existed right at the start of ‘Jack and the Beanstalk’ instead of several pages in; Jack might not have been inspired to swap his cow for those magic beans after all. Bice weighed in at an estimated 101 kg and stood some 1.77 meters tall, just smaller than All Black legend Ritchie McCaw. The only larger penguin is the much younger, but highly fragmentary, fossil penguin from Antarctica, thought to be about 2.0 metres tall, and dating from the late Eocene (about 35 million years ago). Meanwhile, further north in Canterbury, the Waipara River valley was already famous among palaeontologists. It is where specialists can read the ‘toilet paper of time’ of the geological layers of rocks, with extinct marine reptiles in the lower layers and sea birds in the upper. The area had already yielded three other Paleocene fossil penguins, including a currently undescribed whopper, thought to be 1.50 metres tall. Amateur fossil collector, Leigh Love, uncovered yet another large penguin fossil, dating to 61 million years ago, slightly earlier than Bice’s Penguin. This new discovery turned out to be the most complete early penguin fossil in existence. Rosie’s Penguin (Sequiwaimanu rosieae), has been named after the late Rosemary Goord, one of the owners of the farm where Rosie was found. It is a truly beautiful fossil, as if it’s been frozen in a moment of time; the level of preservation, especially the skull, is amazing. 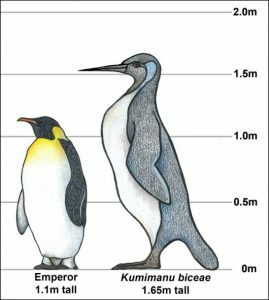 Though not as large as Bice’s Penguin at roughly half the size, Rosie is just a little larger than today’s King Penguin. But why are Bice’s and Rosie’s Penguins so important and how are they rewriting the story of penguin evolution? Very little is known about the earliest penguins that lived immediately after the extinction of the non-avian dinosaurs and large marine reptiles. Gerald Mayr from the Natural History Museum in Frankfurt, led both studies which were funded by a Marsden Fast Start grant to Canterbury Museum’s Vanesa de Pietri. Gerald looked at how Bice and Rosie fitted into the known penguin whakapapa, the family tree that stretches back through the eons. 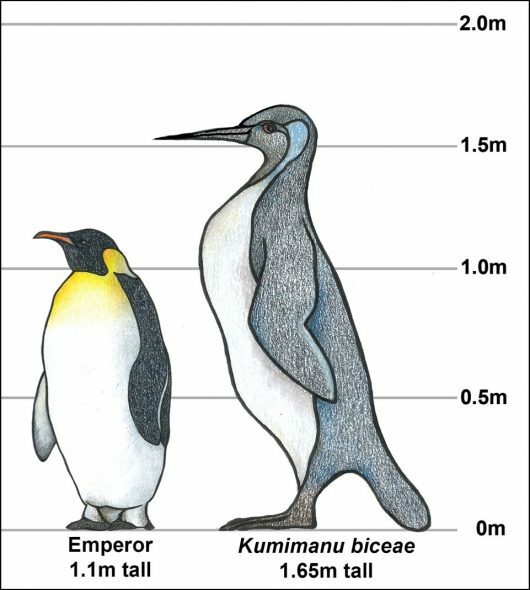 During the Paleocene, penguins ranged in size from those similar to our Yellow-eyed Penguin and King Penguin to true giants like Bice’s Penguin and its currently undescribed competitor in the boxing ring from Waipara. Other giants from the Eocene and Oligocene are separated from their Paleocene cousins by several smaller penguins in the whakapapa. This resurgence of true giants was all over by the end of the Oligocene period (about 25 million years ago), with only the lineage that led to the modern ‘small’ penguins we know today surviving. 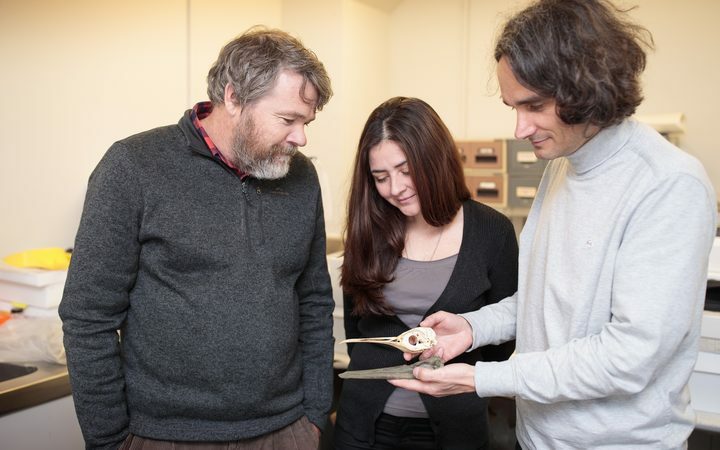 Paul Scofield (left), Vanesa de Pietri (middle), and Gerald Mayr (right), compare the fossilised skull of Rosie’s Penguin to a modern penguin. Photo courtesy of Canterbury Museum. So, what does this new and improved whakapapa v2.0 tell us? It highlights that instead of gigantism evolving only once in penguins, it occurred multiple times. This is similar to what happened with ratites, the bird family that includes the emu, cassowary, ostrich, rhea and the extinct moa. In the post-apocalyptic world following the end Cretaceous extinction, penguins surprisingly quickly accepted the niche job vacancy in the Paleocene marine ecosystem as one of the top predators. 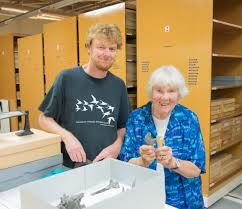 Bice meets Bice’s Penguin: Alan Tennyson (left) and his mum, Bice (right), who inspired his love of natural history, with the fossilised remains of Bice’s Penguin (foreground). Photo courtesy of Te Papa. Released from the constraints of being a lean, mean, flying machine, and from predation pressure from non-avian dinosaurs and marine reptiles, penguins became flightless divers, adopting the penguin body form very early on, as illustrated by Rosie, and in some cases, attaining a truly giant size like Bice. However, the true giants were extinct by the Oligocene-Miocene, due to the explosive radiation of marine mammals including cetaceans, (whales and dolphins), and pinnipeds, (seals and sea lions). It’s likely these newly evolved mammalian predators outcompeted their feathered nemeses, and the giant penguins withered away. This tale of our two penguins shows how the ghosts of biodiversity past can reveal new pages in the evolution of this enigmatic sea bird. But more importantly, Bice’s and Rosie’s tales tells us that new, potentially ground breaking fossils await discovery and may be out there, just around the headland or on the museum shelf, right under our nose. I, for one, will either be out next weekend with my kids, fossil hunting, hoping to find something new, or scouring museums shelves for ‘long lost’ fossils. Where does the penguin fossil found near Kawhia about 10 years ago by the Hamilton Junats young ones fit in this storyline?That fossil is now housed at the Waikato Museum. The giant Kawhia penguin is dated to around 24-28 million years ago, and is one of the giants that was around during the Eocene and Oligocene geological periods, rather than the earlier Paleocene period when Bice’s and Rosie’s Penguins lived.